Self-regulation in the advertising sector is the recognition that the advertising industry (advertisers, agencies and the media) create advertising that complies to a set of ethical rules, namely that it should be legal, decent, honest, truthful, prepared with a sense of social responsibility to the consumer as well as society as a whole and created with due respect to the rules of fair competition. These ethical rules are usually drawn up in the form of a code and the International Chamber of Commerce code very often forms the basis of the national codes. Self-regulation exists in most of the current Member States of the European Union; in some of them it has been operating for several decades. In some countries, advertising is subject to detailed legislation to such an extent that the scope left for self-regulation is very limited. In others, there is little detailed legislation and advertising content is efficiently regulated by self-regulatory bodies. The role of self-regulation is acknowledged in various EU initiatives. The organisation which manages the process of s elf-regulation across Europe is the European Advertising Standards Alliance, of which EACA is key industry member. Copy advice is the provision by a self-regulatory organisation (SRO) of an opinion as to whether or not an advertisement complies with advertising rules. It is provided on a confidential basis and usually accompanied by advice on the amendments necessary to bring a non-complying advertisement into line with the rules. Copy advice is provided upon the request of advertisers, agencies or the media. The International Copy Advice/Pre-Clearance Facility allows advertisers, agencies and media to seek copy advice or pre-clearance where available. These services are currently available in: Austria, Belgium, Bulgaria, Canada, Czech Republic, France, Germany (misleadingness), Germany (taste and offence), Greece, Hungary, India, Ireland, Italy, Lithuania, Netherlands, Poland, Portugal, Romania, Slovakia, Slovenia, Spain, Sweden, Turkey, United Kingdom. Click on the icon below to connect to the International Copy Advice/Pre-Clearance Facility. 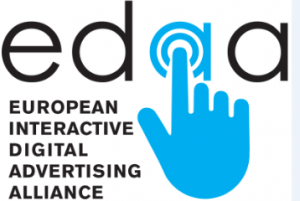 EACA is a founding member of the European Interactive Digital Advertising Alliance (EDAA), a cross-industry self-regulatory initiative developed by leading European bodies to introduce pan-European standards to enhance transparency and user control for online behavioural advertising (OBA). In 2013, EDAA launched the “OBA Icon”, a consumer-facing, interactive symbol that links consumers to an online portal, www.youronlinechoices.eu, where they can find information on the practice of OBA as well as a mechanism for exercising informed choice – if they so wish, consumers may ‘turn off’ OBA. The self-regulatory process on OBA is supported by the European Commission through the OBA Roundtable meetings, which facilitate multi-stakeholder exchange of views. Since December 2010, the Commission organised "roundtable" meetings with broad participation of industry, consumers and civil society. Find out more about EDAA. Find out more about the OBA Icon. 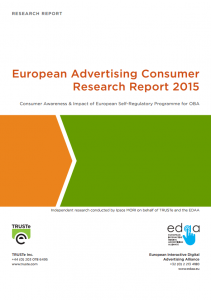 An online study commissioned by the European Interactive Digital Advertising Alliance(EDAA) and TRUSTe, leading data privacy management company, provides a comprehensive picture of consumer attitudes and awareness of the European Self-Regulatory Programme for Online Behavioural Advertising (OBA) across Europe. The study was conducted from 21 October - 13 November 2015 with over 13,000 consumers across 13 different European markets. This webinar outlines the role and main obligations of agencies under the EU Self-Regulation Programme on OBA. The European Association of Communications Agencies (EACA) provides key insights into the Programme as a major stakeholder, and how today's regulatory and self-regulatory landscape in Europe represents a compelling reason to join and promote the initiative now. In addition, it talks about the Consumer Awareness Campaign, with its focus on empowering consumers with increased transparency, choice and control over their behavioural advertising preferences. Finally, agencies are provided with valuable insight from a participating company - Xaxis - and hear first-hand from their experience in joining the Programme, and the importance of the initiative for their clients and suppliers.